Delighted Momma: $50 Giftcard Giveaway To Society6! $50 Giftcard Giveaway To Society6! Today's giveaway is hosted by Society6, which is an awesome shop that carries the coolest iPhone cases, T-shirts, art prints and more! All of the artwork you see on Society6 is created by artists from around the world. Society6 uses the highest quality materials, so you can be sure what you are getting is only the best! 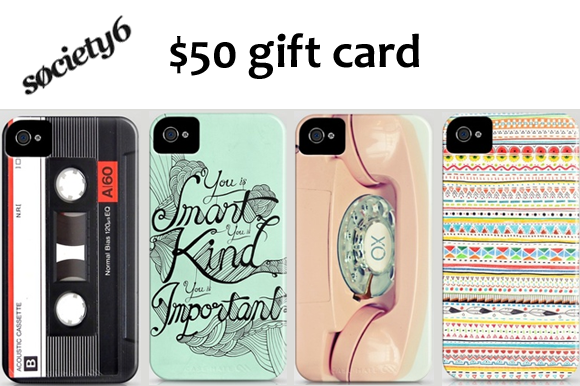 Society6 is giving away a $50 gift card to one lucky reader. You can use it towards whatever you like in their shop. So even if you don't have an iPhone there are still lots of options! Visit Society6 and take a look around. Come back and leave a comment letting me know what you love. Pin your favorite product from Society6 onto Pinterest. Please leave the link. Good luck! A winner will be chosen at random and announced April 27th. They have so really cute framed art pieces! Great giveaway! what a fabulous giveaway - everything is just amazing, their iPhone cases are just to die for! I like Delighted Momma on facebook! oohh! i really like the colorful chevron iphone case :) pretty! And a lot of their other prints! I love the anatomy of a kiwi print! Great giveaway. Thanks for the opportunity! Have a great weekend friend! I like the watercolor chevron pone case! And I follow through GFC. I'd get the basset hound ipad skin. It is adorable. I could be on that site for a long time! I like you in facebook and I love the there are no rules iphone case! They have some fabulous iphone cases, would love to have one! I adore their iPhone cases. I've been drooling over the tribal one for ages! I follow you! Duh. :) And I love The Destination print. So cool! Visited Society 6 & I love the iPhone cases! My favorites are the Eiffel Tower one that says "Paris is Always a Good Idea" and the Watercolor one with the beach scene. I pinned them both on Pinterest! I just got an iphone and they have such a huge collection of cases!! I want the retro love or Substitution case! I pinned a case on pinterest! I like the delighted momma on facebook! I love Animal's Tea Party iphone case! Love this site! I really like the framed prints, especially the Fox print and the Wander print! Thanks for the giveaway! I love the 'Be so happy' canvas. Super fun giveaway! I liked Delighted Momma on Facebook! I'm a follower! Love your blog. I love the iPhone cases, especially with the artwork of Cassia Beck and Teagan White. They're so pretty! It was so hard to pick a favorite to pin, but I went with this geometric iPhone case! I love the laptop skins! I can't believe those iPhone cases! They are all amazing! I think my favorite is "The Light is a Bringer of Beauty"
I love their tshirts and iPhone cases, such cute designs. The fox and owl t shirts on the first page and just adorable, and there are so many funny ones! I'm a follower and I like the Dr. Who hoodie. I would totally hang that in my apartment right this second. I'm obsessed with Society6! I'm a GFC follower. Such cool stuff. Love it all but obsessed with the DANDELION LOVE iPhone case. Thanks so much for the chance!!! I love the OVERDOSE|ESODREVO iphone case! Love so many of the iPhone cases! tweeted about the giveaway from @moorehe2 - fingers crossed! I have bought cases from them for other people, I would like one too! i love the one with musicasette! i'm a fb follower of delightedmomma as ele paradise marchetti! Pinned fruit of the spirit print (would look fab in my new apartment) @nataliemarie on pinterest! I love the dancing dahlia iphone case! I'm a follower, I liked the cards called Moment Catcher! I love cover with pink telephone! Hello and thank you and society six for this wonderful giveaway. I liked you on fb as well. My name is brittney Lynn on fb. My favorite iPhone case is the let's get lost together one. http://society6.com/product/Lets-Get-Lost-Together_iPhone-Case. Thank you and have a great day! I follow your blog (love!) and I love the iphone covers! I love society 6!!!! Especially the Glamorous Sky iphone case!!! I want it so badly! I love the This Is My Lightsaber Vader Version Hoodie. Liked on facebook as Austin Baroudi. I can't decide which case I love. I'm on page 11 and keep saying 'ooh, I like that too!' So far 'in dreams' and 'free spirit' are tops! I liked DM on fb! I love the Kiss of life iphone case the best! I love all of the iphone cases! They are so colorful! I liked delightedmomma on facebook! ... and I pinned it too! I love the Doctor Who T-shirt! Love the blue tile iPhone cover! I may have to splurge! Hey there! So...I honestly don't know how I would pick just one. I got to page 35 of the iphone cases and were in love with all of them! And I also pinned one!